Internet comments on articles are where many ideological battles are fought these days, and in spite of the admonishment, “don’t read the comments,” I keep doing so anyway, out of a morbid curiosity. In the post Zimmerman trial articles, I find one persistent idea put forth, mostly by trolls, but some genuine folks actually believe this idea, as well. It’s the idea that racism is an illusory specter that doggedly haunts black people. In the age of Oprah and Obama, racism shriveled up and black people just have a collective chip on their shoulders. We’ve heard such sentiments phrased in a myriad of ways. 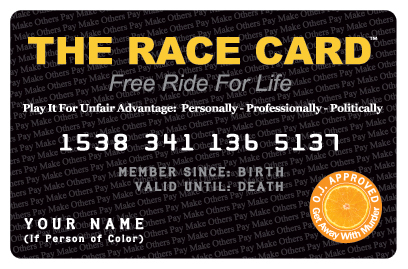 They range from accusations of “playing the race card” to “black people are the true racists because they only see race.” This belief occasionally comes from black folks themselves—see Ward Connerly and Clarence Thomas. The most insidious form of this sentiment comes in the form of gas lighting racism. This is where (mostly) (some) white people will twist themselves into logic pretzels to deny racism, even when it is obvious. The first time I experienced this was when I was in college. I was a part of an anti-discrimination task force made up of students, faculty and staff. The point of the task force was to examine racial issues from our respective spheres, and then report them and make recommendations to the college. As a member of the task force, we were given access to the historical records of the college. I discovered that there had been a cross burning in front of an on-campus house full of black students in the 70s. I remember relaying this information one time at lunch. One white girl, who was very sweet, began to come up with a series of bizarre reasons why a cross burning couldn’t possibly be racial. One of them was, “Maybe they were pagans.” And it was just coincidental that the burning cross was in front of where a group of black students lived. At the time, I was stunned. Somewhere along the line, I came to realize that to some white people, even overt racism is a thing of the past and black people are just over-sensitive and over-emotional. This attitude—of ‘gas lighting’ racist incidents—was just the first of many that I’ve experienced. I have come realize that when people say, “I don’t see race,” they mean, “I don’t see racism.” It’s difficult, because often the people who do such ‘gas lighting’ are good, well-intentioned people.